Roj Dae-pa-Adar Mah Ardibehesht, 1382 Yz. It gives me great pleasure to put up two new books on the Ilm-e-Khshnoom SkyDrive today. 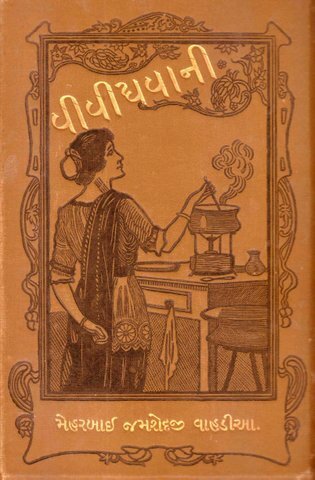 Vividh Vani, part 1 and part 2, by Meherbai Jamshedji Wadia has been a classic reference book for thousands of Parsi ladies over one hundred years. 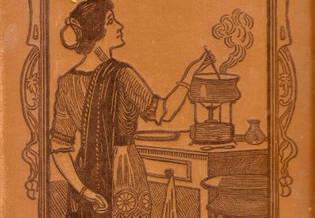 First published at the turn of the 20th century, this mammoth book of two parts totaling 1500 pages carries over 2000 recipes, ranging from traditional Parsi to continental and Indian cuisines. Written in an era where all cooking was done on wood stoves and without fancy gadgets, no running water and no refrigeration, Vividh Vani offers us an in-depth look at the hard life of the traditional Parsi lady of those times. By itself, the book is very valuable. But what makes it even more interesting to students of religion and Parsi history is the sad story it presents of a time when the medical sciences had not developed, and when contagious diseases could ravage entire cities in a few months. It is obvious for us to picture Meherbai Wadia as an elderly lady, retired from her parental duties, sitting down to collect and write out all the delicious recipes she would have learnt from her elders and through her own experience. But the reality is very different. 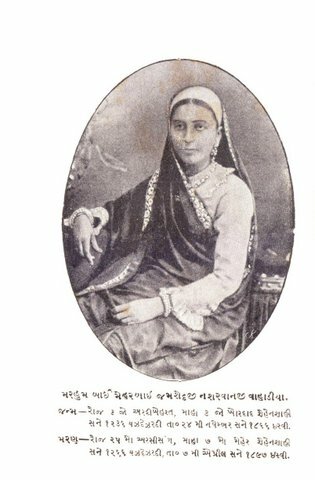 Here is the picture of Meherbai taken from her book which will give readers an idea as to her life and times. Meherbai was born on 24th November, 1866 in Mumbai into a well to do family. A traditional education, along with innate love for cooking saw her talents grow very fast in the field of gastronomy. At a very young age, Meherbai began collecting and noting down recipes for her own use. As this collection grew, it perhaps entered her mind that the same could be published, for the benefit of other community members. She was fully supported and encouraged in her endeavours by her mother Piroja Jamshedji Wadia. But alas, she would not live long enough to see the fruit of her labours. The last decade of the 19th century was a period of great unrest and upheaval. As the cotton mills of Mumbai started working overtime to satisfy the crazy demand for cotton, there was a great influx of immigrant workers into the city. (Does this sound familiar, over 125 years later?) The developed parts of Mumbai had no place to house these teeming thousands, and soon makeshift, ramshackle tenements began springing up near the mill areas of Parel. Unhygienic living conditions, poor or no sanitation, too many people cramped up in small places… all these were prime settings for the onset of an epidemic. The filth in these areas attracted rats whose population soon exploded. The interaction between the rats, the rat fleas and humans gave rise to the first cases of bubonic plague – a dreaded disease that could kill within four days in 1896. Highly infectious, and visible through the enlarged lymph glands, the plague struck Mumbai city without warning, wiping off large swathes of population in days. A great feeling of fear swept through the city and thousands of workers fled Mumbai to their native places, some carrying the dreaded disease with them. As the British government tried to understand what was causing the deaths, it was left to a ‘native’ doctor to investigate the disease (at great risk of personal contamination and death). 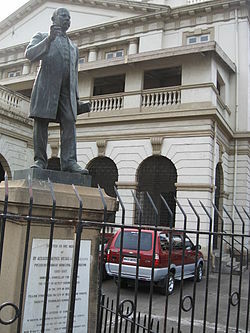 Dr. Acacio Gabriel Viegas was a Goan doctor settled in Mumbai and also a past president of the Bombay Municipal Corporation. He trawled the shanties and slums of the mill area and came to the conclusion that the disease was bubonic plague, carried through by rats and rat fleas. He immediately set about measures to tackle the rat population and also to improve the sanitation and hygiene in the mill areas. In all this hullaballoo, another Parsi was destined to play a significant part. This was Dr. Kaikhushroo Nusserwanji Bahadurji. Born on 4th November, 1860 in the village of Umra, near Surat, Dr. Bahadurji had a brilliant academic career. Matriculating in Latin in 1878, Dr. Bahadurji applied for and won the coveted Gilchrist Scholarship in 1882, standing first throughout India. Using the scholarship, Dr. Bahadurji departed for London in August 1882 and enrolled at the London University’s department of science and medicine. Here he successfully cleared the examinations for the degrees of MRCS and MB. He then diverted his mind to Forensic Sciences and completed his graduation with Honours in the subject. Thereafter, he studied surgery and successfully obtained the degree of Bachelor of Surgery. Finally, in 1888, Dr. Bahadurji obtained the degree of MD, the first ever Indian to do so, not only passing, but in first class with double Honours! The Trustees of the Gilchrist Scholarship were much pleased with these endeavours and extended the scholarship for a further one year, gifting him the princely sum of 75 Sterling Pounds and requesting him to expand his knowledge in the field of Pharmacology. Dr. Bahadurji travelled to Berlin and began his studies under two famous German doctors of those days. Returning from Berlin to London, Dr. Bahadurji then commenced studies in Lunacy and Insanity, clearing exams for these new subjects. Armed with these degrees and letters of recommendation from many British and German doctors and professors of Medicine, Dr. Bahadurji returned to Mumbai, going straight up to meet the governor, Lord Reay (after whom Reay Road is named.) Impressed with his credentials the Governor immediately appointed Dr. Bahadurji as Additional Professor of Clinical Medicine and Pharmacology at the Grant Medical College in Mumbai. This move caused great resentment amongst the existing British doctors, who looked down upon the natives and preferred to hoard all the top posts in the medical field for themselves. Through subtle politics, by harassment and outright non-cooperation, the British ensured that Dr. Bahadurji could not function upto his capacity at the College. Disgusted with this turn of events, Dr. Bahadurji left Grant College and started his own medical practice and soon turned highly popular. Not content with treating patients, Dr. Bahadurji was also at the forefront of all national movements of those days, raising his voice against any British injustices (and there were many) and carrying the debate through his great powers of speech and persuasion, along with his prodigious knowledge. Soon Dr. Bahadurji ran for and was elected as a member of the Bombay Municipal Corporation and began taking steps to improve the Public Hygiene department. It was at this time that the Plague struck Mumbai. Working with Dr. Viegas, Dr. Bahadurji fearlessly went into the slums and shanties to find the infected persons and isolate them, so that the spread of the disease could be controlled. Also mindful of the effect of the plague on the Parsis, Dr. Bahadurji obtained a plot of land in Parel and started the ‘Parsi Fever Hospital’ there, admitting all infected Parsis and treating them, absolutely free of charge. Those were the days of conservatism and fear. No other person would dare go near an infected victim. No person of another caste or religion would touch another. 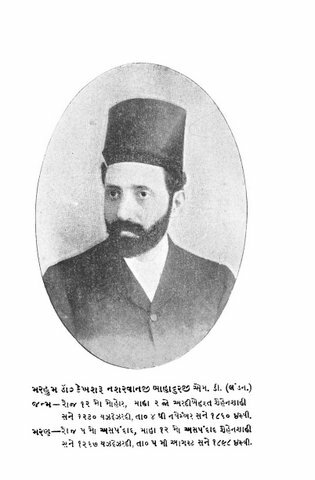 In these circumstances, Dr. Bahadurji’s Parsi Fever Hospital was a godsend where Parsi ladies and gents would be treated by their own community members. By some quirk of misfortune, one of the persons infected by the dreaded plague was lady Meherbai Wadia. As she was shifted to the Parsi Fever Hospital by her mother, both ladies came into close contact with Dr. Bahadurji, who was just six years elder to Meherbai. What a lovely couple they would have made… a gastronome extraordinaire and a Doctor full of humanism and compassion… but it was not to be. Despite the best efforts of Dr. Bahadurji, Meherbai could not be saved. She passed away on 7th April, 1897, aged just 31 years. Her dream of printing the book of recipes was in danger of remaining a dream. In those days of sorrow and destitution, Meherbai’s mother Piroja found great compassion and succour in the company of Dr. Bahadurji, who was like a son to her. Through constant visits, heartfelt talks and hours of company, Dr. Bahadurji gave solace to the troubled mind of lady Piroja and provided the much needed strength to enable her to come to terms with her loss. Unlike most Parsi women of those times, lady Piroja had only one child – Meherbai, who had been taken away by the plague. In these hours of conversation, lady Piroja mentioned Meherbai’s dream of the cookery book to Dr. Bahadurji, who encouraged her to go ahead with the idea and fulfill the dream posthumously. As a sign of her deep respect and admiration for the young doctor, and also as a measure of his services to the community, lady Piroja asked Dr. Bahadurji’s permission to dedicate the book of her late daughter in his name. Dr. Bahadurji agreed and would also perhaps have written a forward for the book. But a cruel tragedy awaited. As lady Piroja busied herself in preparing Meherbai’s book, Dr. Bahadurji threw his heart and soul in the treatment of the plague afflicted, both Parsis and non-Parsis. At a spectacular meeting of the Parsi community called by the Trustees of the Parsi Punchayet on 13th November 1897, Dr. Bahadurji was honoured for his services and presented with a cup and scroll by Sir Jamsetjee Jeejeebhoy, the 3rd Baronet. But our community has the habit of pulling down those who are first put on pedestals. With a view to preventing the spread of infection, Dr. Bahadurji was very strict with the relatives of infected patients and refused to allow them to stay at the Fever Hospital. This caused some resentment, which was cleverly exploited by a few shameless people. But Dr. Bahadurji continued working, not caring for his own safety. In a cruel twist of events, he who had inoculated so many and treated hundreds, himself fell prey to the dreaded disease. After a short illness, Dr. Bahadurji passed away on 7th August, 1898. As the whole community, nay the entire city of Mumbai grieved the death of Dr. Bahadurji, in one corner of the city, lady Piroja was devastated that the very person who was to write the foreword of her daughter’s book had also departed. 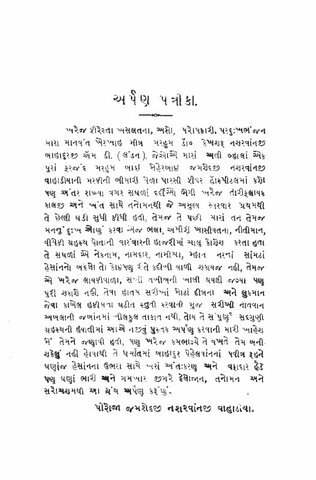 After many trials and heartaches, lady Piroja presented the first edition of Vividh Vani in around 1903. The book was a runaway success and soon four editions had been printed by 1915. The fourth edition of the book came into my hands and has been scanned and put on the SkyDrive by the hard labour of my unnamed friend, Mr. N.
Readers of Frashogard, as you download this book and before you go through the recipes, I would like to draw your special attention to the heartfelt dedication written by lady Piroja in honour of Dr. Bahadurji. The language, the adjectives and the pure emotion and pain which comes through lady Piroja’s dedication can simply not be translated into English. A feeble attempt is given below for the benefit of English only readers. Dedicated to my venerable and true friend, late Dr. Kaikhushroo Nusserwanji Bahadurji, M.D. (London), a man of truly angelic temperament, righteous, philanthropist, gladly bearing the suffering of others, who took, without keeping any distance, real praiseworthy care and gave patient and compassionate treatment to my most beloved, one and only child, late Bai Meherbai Jamshedji Nusserwanji Wadia, in the Parsi Fever Hospital, during the bubonic plague, right upto the last minute, and who also thereafter, through his regular visits, tried to reduce the pain and suffering in my mind and body, by his large-heartedness, righteous and brilliant nature. It is impossible for me to ever repay the debt of gratitude I owe to this truthful, honourable, celebrated and great man. The place left behind by this most likeable, munificent doctor can never be filled. It is beyond the reach of a simple uneducated woman like me to provide the right words of praise for such a giant hearted human being and most talented doctor. During his short life, I had expressed my desire to dedicate this trifling book to him, but most unfortunately since I could not do so at the right time, I am compelled to dedicate this book, with my body, life breath, heart and true conscience to the loyal memory of the pious Ruvan of this religious, brave warrior, with overflowing feelings of gratitude, but with deep-seated pain and sorrow in my heart, with bowed head and tearful eyes. And while you may enjoy reading about the 8 types of Akuri, 76 types of Achar (pickles), 36 flavours of ice-cream (hand churned in a wooden bowl), 60 varieties of eggs, 15 ways of making omelets, 32 types of cutlets, 50 varieties of curry, 27 kinds of custards, 57 recipes of cakes (plus 17 types of cheesecakes), 31 different jams and preserves and many many more dishes which we have probably never heard of, or will possibly never make, I would like you to spare a thought for the young lady who, in those times of extreme hardship and inconvenience, managed to put together a book of this magnitude at such a young age. I would also like you to spare a thought for the sorrow of a mother, losing her one and only child, and the hardships she must have faced in getting the first edition of the book published. And of course I would like you to pass a thought of gratitude for the young life, so tragically cut short, of the supremely talented and deeply humanistic figure of Dr. K. N. Bahadurji, whose acts of compassion and true medical kind-heartedness would be impossible to come by in today’s day and age. May the Ruvans of Behdin Meherbai Behdin Jamshedji and Behdin Kaikhushroo Behdin Nusserwanji progress ahead in their journey towards Frashogard – salvation. Ervad Saheb this indeed is a wonderful and heart touching article which u have brought out for all the parsees to read and ponder upon. May their souls be in peace and progress ahead in their journey towards our Lord Ahura Mazda. God Bless them all and God Bless U & Ur family too. lovely… if it were not for you we would never know who these were, what miracles (considering the times we live in) they performed, and how they triumphed. A sanatorium in Deolali, near the Bai Pirojbai Edulji Chinoy Fire Temple, is also named after the Late Dr. K. N. Bhadurji. Scenes from the hindi movie “aa gale lag ja” was also filmed in the sanatorium. A portrait of Meherbai Wadia was on display at the Lal Baug Agiary before it was renovated in the past few years. Thank you Ervaad Hathiram for bringing to light the history in such a touching article. That is right. It was constructed out of subscriptions received in memory of Dr. Bahadurji. Thank you Ervad Marzban for the lovely article. I had tears in my eyes as i read through it. Thank you Ervad Hathiram for such an insightful article. You write with empathy in such simple language that it evokes pictures in the mind and brings tears in our eyes. May the ruvans of the departed souls reach the highest realms. Warm Regards. thank you Ervad saheb for this insight. We possess an old original of the vividh vani which was treasured by my late mother. We still occasionally refer to it for traditional parsi recipes. Bur we did notn know the tragic story behind it. Is there an English translation available? Many people have expressed interest in this book but can’t read Gujerati. Would it be at all possible to buy this book in Bombay? Thank you. The book is long out of print. You can download the PDF version from the SkyDrive and have it printed. That is the only way to have a physical version. If you have a tablet or other device you can of course keep it in the kitchen and read from it while cooking. Like Manijeh, I would like to ask if there is an English Translation of these Books as people like me, who cannot read Gujrathi, would be very Keen to Buy and Own these Treasures of the Wonderful Parsee cookbooks from the the Distinquished Lady Meherbai Jamshedji Wadia. The story behind the publication of the Books is heart Rending. Makes me Proud to be Parsee and A Zorastrian. As usual my dear dedicated son has downloaded the PDF and presented me with a full fledged copy of the same yesterday. I too had some of these small booklets but had never imagined that this lady could be so young when she collected the recipes. Yesterday night we had this discussion as to “what if we could transliterate it into English for my little grand daughter who MAY inherit my cooking abilities, and now Ervad Saheb’s comments of “if someone could transliterate it” tempts me into doing so… How far i am going to be successful i dont know but I pray that I am have the same dedication to atleast “transliterate” them. Shall definitely make an attempt and atleast make a beginning. I would suggest that you first make a chart showing the different weights and measures, translated into modern metric weights like Kgs, grams, litres etc. This will be essential if you want to make any sense of the recipes. I would suggest you have a look at Bhikhoo Manekshaw’s cookbooks where many of these old weights and measures are given. This has to be the first step before you can commence on anything else. If the weights and measures are wrong, the recipes will turn out horrible. Do read the introduction where Meherbai has explained the differences between the various weights even at that time. All the best in your endeavours. it is so touching that people can have such devotion towards betterment of other people. hats off to Dr.K.N.Bahadurji for him being such a nice person. Really a great job! My grandmother had the books and they were her Holy Book for cooking. Though the measures are in tolas and other old measures – she would meticulously convert them and make the bhakras, vasanu, badam pak and other goodies from the book. She was a great cook herself – having done a diploma course from Dadar Catering college at the age of 50 after her children were grown up and her husband no more. Though i am not parsee – it is great to have a copy of the book and i hope to be able to make some of these great dishes myself. Did Dr. K N. Bahadurji have any sibblings? Thank you for this delightful insight into the fiery and gallant DrBahadurji! We’re working on a book on the Bombay Plague and would appreciate any information you might like to share on DrBahadurji. Yes, Vividh Vani should certainly see an English Edition.